If your looking for information on how to start a home care agency business in California, Texas, New York, Florida, Georgia, Michigan, Ohio, Illinois or any other state, one of the most challenging parts of starting a home health care agency is knowing how to start a home care agency quickly and cost effectively, creating a home health care business plan and developing all the required home health care documents, forms and manuals that allow you to operate your agency professionally and efficiently. This is one resource you won’t want to be without when starting a medical or non-medical home care agency business. The home care industry is booming. Two key factors include our desire to remain in the comfort of our own homes as we age, and the aging of the population. A home health-care agency is a promising business with unlimited potential. The Home Care Business is an industry where there will always be a shortage. Now is the right time for you to tap into this multi-billion dollar industry. Comprehensive Home Health Care Agency Start up Guide including: Starting your business, naming your business, creating a tag line, choosing a business structure, financing options, office requirements & setup, banking, licencing requirements, business and employee taxes, Insurance requirements, choosing & retaining quality employees, background checks, payroll including required government forms, advertising & marketing your services, building a referral network and contracts and agreements. Home Health Care Business Plan Samples including: Executive Summary, Company Services, Management, Industry Analysis, Recent Trends, Market Analysis, Target Customers, Competition, Market Strategy, Pricing, Location/Premises, Personal & Staff, Insurance/Environment/Government Regulations, Confidentiality & Critical Risks, Investment, and Financial Requirements & Expenses. 30 Page Employee Handbook Manual including: Confidentiality, Probationary Period, Uniform, Dress Code, Workers Compensation, Remuneration, Hours of Work, Overtime, Holidays, Health Benefits, Time Off, Sick Time, Job Description, Classifications, Conduct, Phone Usage, Gifts and Advantages, Work Related Travel, Client Related Travel, Internal Training, External Training, Privacy Notice, Use of Personal Information. This comprehensive how to start a home health care agency guide, business plan samples, business plan guides, manuals, forms, and template package offers information and an array of tools, especially designed for delivering medical or non-medical home care support services. If you are uncertain if the home care business is for you, it will help you make that decision. And, if you decide to go ahead, then it will be a tremendous asset and save you a lot of trial and error headaches. 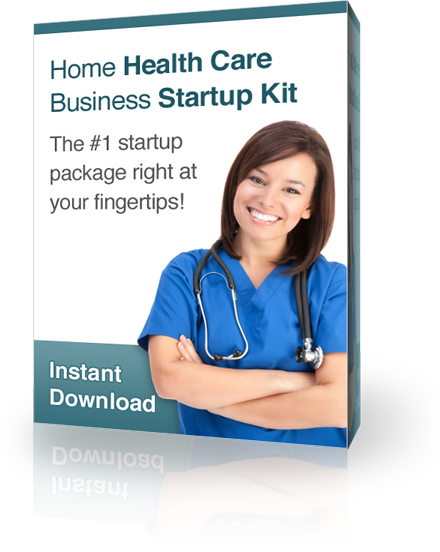 Diligently researched and backed by over 20 years of hands-on experience, the Home Health Care Agency Business Start Up Package will put you on the fast track. Receive all the above ready made guides, manuals, forms and templates that you can personalize, customize and print in minutes for only $129.95. Our How to Start a Home Health Care Agency Business Package includes over 100 professionally formated, comprehensive documents in WORD and EXCEL format and are all FULLY CUSTOMIZABLE so you can add your Company logo, customize footers, and make changes to meet your company needs. Receive all these ready made forms and templates that you can personalize, customize and print in minutes. "The documents provided were pleasantly surprising. This package of resources and templates have provided a sense of security to my burgeoning home care agency by way of evident and successful experience in the field of home care." "You really understand the home health care industry. Your home care business start up guide and business plan sample content promotes the highest business standards. Your forms and templates are easy to use and adapt and is highly customizable. The information included is of the highest quality and I am proud to use them in my home care business." "Although it is less than one year since I started my own home care business, I have already earned almost six figures utilizing your home care forms and templates. With your home care business start up package I have acquired very special tools to run my own home care business, and I must say the detailed materials were very professionally prepared. "The how to start a home care business guide was informative and well designed. It allowed me to effectively start up my own home care business. The information provided in the guide and the business plan sample made the start-up process effortless. I highly recommend the start-up guide and all their forms and templates. It has saved me so much time and money, as I had initially contemplated purchasing a franchise business." "The business plan guides are a wonderful guidance through all the issues in the process of preparing a home care business marketing and business plan. I love this business start up package because it included everything I needed to start my business and all the forms and templates are so convenient and easy to use." "We were contemplating starting a home care business. We had researched various franchises, but decided to go into the home care business on our own because a home care franchise was unsuitable and out of our price-range. It was our great fortune at this point that we came across your website. The process of starting and growing a home care business can feel overwhelming. Sometimes you don't even know where to start. But having your home care business start up package to offer guidance from the first day gave us a sense of security and confidence to go forward. Thank you! Copyright 2019 © HAMC International Solutions, All Rights Reserved.